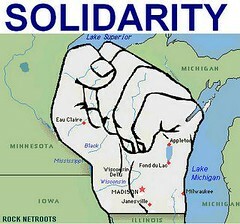 This is for all my friends and former colleagues in Wisconsin, who are making American history as we speak. America’s children will study these weeks in their US history and US government classes. These people in the streets these past few weeks — my friends — are our heroes, and our future generations will celebrate them. Student revenge: assign a teacher homework!